Dimensions 1 by 9.75 by 12.25 in. 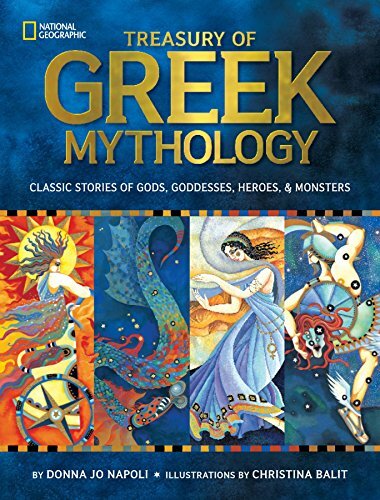 Mythology: Timeless Tales of Gods and Heroes, 75th Anniversary Illustrated Edition | Tales from the Arabian Nights | Treasury of Norse Mythology | Treasury of Egyptian Mythology | Everything Mythology | D'Aulaires' Book of Greek Myths | Oh My Gods! The new National Geographic Treasury of Greek Mythology offers timeless stories of Greek myths in a beautiful new volume. Brought to life with lyrical text by award-winning author Donna Jo Napoli and stunning artwork by award-winning illustrator Christina Balit, the tales of gods and goddesses such as Zeus, Aphrodite, Apollo, and Athena and heroes and monsters such as Helen of Troy, Perseus, and Medusa will fascinate and engage childrenâs imaginations. National Geographic completes the book with embellishments of each story: sidebars for each god, goddess, hero, and monster link the myths to constellations, geography, history, and culture to help young readers connect the stories to real life events, people, and places. A family tree and a âcast of charactersâ profile page help make relationships between the characters clear, and a mapping feature adds to the fun and fascination. Resource notes and ample back matter directing readers to more information round out this luminous book. Sure to dazzle all those intrigued with the fantastic tales of Greek mythology and enchant new readers, this vibrant book will soon become a family keepsake. VisitÂ www.natgeoed.org/commoncoreÂ for more information. About: School Library Journal Best Books of 2011Eureka!